The worst of it all was going back to the party from the courthouse on election eve with the result in hand. At least, while walking the few dark blocks to the courthouse with two other political action committee members, I wasn’t alone. In those minutes there was still some hope. La esperanza es la última que muere, it is said: “Hope dies last.” This is probably an ancient proverb, no doubt expressed somewhere in the writings of a Seneca or a Cicero and, if so, even way back then, it would probably have been a thought lifted from older sources. Human nature, after all, hasn’t changed perceptibly since writing was invented, and before that happy innovation we have no record. We had lost in the election by a margin of 44 percent to 56 percent. As a result, all eleven public libraries in our county would have to be shut down, perhaps never to reopen. The election night party at the restaurant was full of people who had worked very hard to get tax-base funding for what was once one of the finest library systems in Oregon. I knew it was over, but they didn’t know that yet, and it was my duty to inform them. A few minutes before leaving the courthouse I’d been handed a printout listing the election results. I had just enough time to read it, mutter “Damn!” and glance up at the editor of our small local right-wing weekly newspaper and note his smug grin before the local daily’s lead reporter held her recorder up to my face and asked for a statement. This too was my duty. A few days before the election I had written two formal statements for others to use—one magnanimous in victory, the other courageous in defeat. I hadn’t thought that I’d be called upon to speak for the Save Our Libraries campaign, but those whom I’d written it for weren’t there. “Naturally, we are disappointed by the results but we are not discouraged . . .” I began. Walking back down Roseburg’s Main St. and trying my best to hold grief at bay long enough to do what was required of me, my thoughts ran back to ancient times—Alexandria burning, Goths at the gates of Rome. Sometimes it is best to focus on your anger and resentment, if that gets you through. It was better, for a time at least, to rage against the loss, than to think about the damage that would inevitably follow. These barbarians, I thought bitterly, were not menacing at the gates now but had entered our cities and, being modern barbarians, they weren’t burning the libraries, merely “defunding” them. And I had failed to prevent it. Fear is what drives an anti-taxation campaign, both the deliberate instilling of fear as a campaign tactic and the simple existence of fear as a pervasive force within our national culture. As bitter as I was on that night (and I was as bitter as the waters of The Apocalypse), I knew that my neighbors were not against libraries. Their vote was, I knew, compounded of rejection of our government itself and an embracing of the fear of being “taxed to death.” Unkind of me though it was, the phrase “fear-crazed tightwads” had struck me as an apt description of the opposition during the months leading up to the election. The fear of the voters was mirrored within our library system, but there it was a quieter fear, marked by the weeping of librarians. It is, I assure you, a very sad thing to hug teary-eyed librarians and sadder still to feel helpless while doing so. By election night of 2016, after several years of ever-dwindling funds, annually reduced hours of service, and yet more staff layoffs, what was left of the county-wide library system hadn’t met anyone’s standards of adequacy for eight consecutive years. “It’s never open,” had become an occasional argument for closing it all down. Those who care about public libraries tend to care very deeply about them. At the county fair a woman came up to our booth and very nearly burst into tears talking about how important those libraries are to the poor folks whom she served. 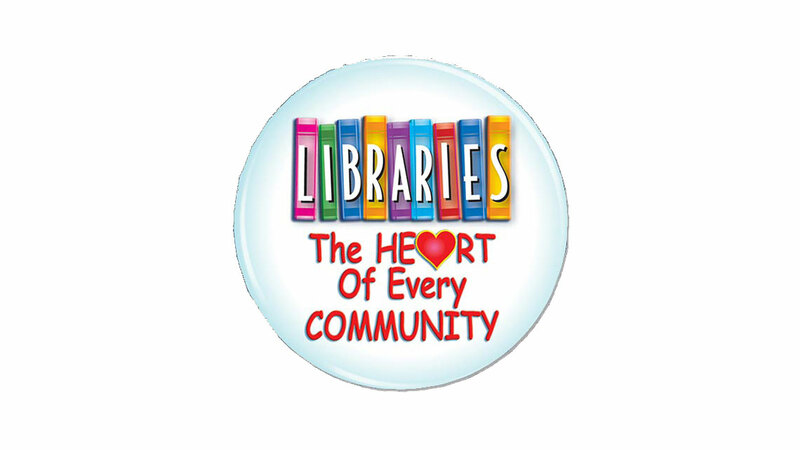 “Libraries: The He♥rt of Every Community” reads a lapel button that I wore all summer. If so, we would shortly become a heartless community. I tried not to think about the kids as I walked, but of course it was unavoidable. Preschool Storytime, Summer Reading, student homework sessions on the computers, and librarians visiting the schools to promote literacy—all of it gone. There really wasn’t any time to process the loss in those few blocks of walking, alone, toward what I knew would be a room full of shocked and dismayed neighbors and friends. I found myself repeating a hopeless mantra: “Well, it’s finally over now. It’s all over now. It’s over. . . .” Except, of course, it wasn’t over—at least not yet for me or for those thirty library supporters awaiting the news. A television news reporter from Eugene stood on the sidewalk outside the restaurant with his camera mounted on its tripod. I wanted to breeze past him, but courtesy and a sense of duty made me pause long enough to tell him the results. He asked to interview me. I’d managed to talk to two reporters without breaking down emotionally. This was very professional of me, I felt, as I headed for the backroom that we’d reserved in hope and would leave in despair. A still photographer from the local daily and our local television news reporter had both come to the party while I was gone. Everyone looked up at me as I held up the printout. I sat back down at my place at the table to stunned silence. The lights went up for the TV camera, and I soon heard my words being spoken by the president of the library foundation. There was an odd satisfaction in hearing the little concession speech that I’d crafted serving its purpose—to provide sure words to someone who’d been struck speechless moments before. The room emptied pretty quickly after that, until only I and my friend Karen remained. I’d promised to give the news director at a local radio station an election night interview, and we waited there among the vacant tables and chairs until he called. Then Karen and I walked out together, back to our rides. “I really thought we would win,” Karen said. “I figured that we’d lose,” I lied. Robert Leo Heilman is an award-winning essayist and author who lives in Myrtle Creek, Oregon. Thank you for sharing your perspective on this painful story. As a regular library patron, I'm grateful for the opportunity to share resources and witness all the ways children and adults benefit from them. Sadly, our democratic system allows fear and greed to overrun cooperation and community. I am hoping your libraries will be restored in the future. I am discouraged. Although Elkton didn't have a library branch, we had books delivered weekly to our local volunteer library located in the Elkton Community Education Center--like back in the good old days of the book mobile that circulated books and librarians to under-served areas like Elkton. Can it be that the people behind this travesty do not want the people to even read, but before destroying education for the rabble, they will start with the libraries? The loss of libraries is the deepest kind of sadness. We have been without elementary librarians for years now. It seems an easy budget cut to some. I mourn with you and thank you for your writing.